A “stone of good fortune”, Imperial Topaz has been credited with bringing prosperity and abundance to the wearer. Imperial Topaz is supportive of visualization, manifestation, creativity and generosity, which will attract prosperity into one's life. 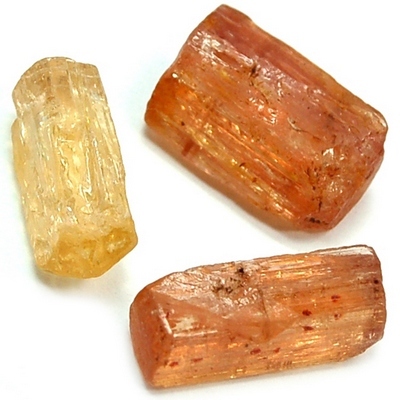 Imperial Topaz facilitates strengthening of the personal will, as long as it is aligned with the highest good. Meditating with Imperial Topaz can assist one in synchronizing thoughts and actions with intention, to help with the manifestation of desires and goals. Imperial Topaz is especially good for those who feel they have lost their faith, as it will bring Divine energies from the Crown Chakra into the Heart and Solar Plexus Chakras. The Golden Rays of Imperial Topaz will recharge the holder, both physically and spiritually. Imperial Topaz will help to attract teachers and mentors into your life at the exact time they are needed. This Topaz will allow you to overcome self imposed limitations, helping to recognize your abilities and move forward with generosity and an open heart. Physically, vibrant, golden-colored Topaz (Imperial Topaz) is beneficial for general health as well as for eyesight. Golden Topaz can bring healing to ailments of the endocrine glands, gallbladder, liver, and kidneys. Golden Topaz can be placed in body-layouts, on affected areas, and can also work well in manifestation grids. Click Here to see Imperial Topaz in our online catalog.